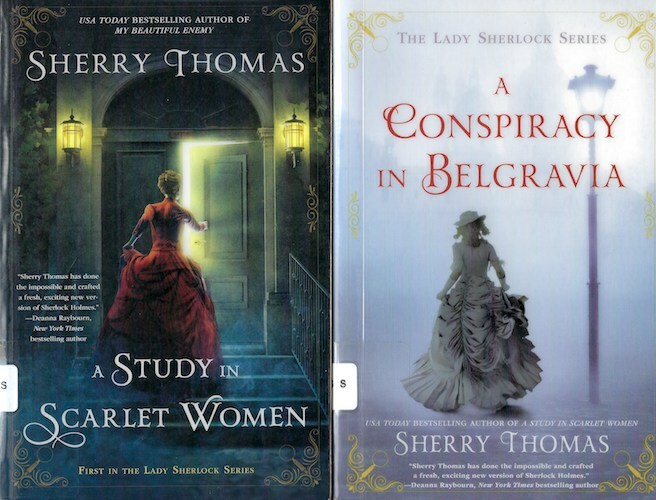 The Lady Sherlock series is… fine? I recently read the first two books; they’re fun without being spectacular. I’m not sure I could tell you any of the intricacies of the actual mysteries, which always seem to be entirely too convoluted. One of Agatha Christie’s rules of mystery writing is that the motive should be something simple and everyday. These books do not follow that rule. However, I’m not here for the mysteries. I’m here for the characterization of women in Victorian London figuring out how to be transgressive and get away with it. Charlotte Holmes losing her virginity and making sure it gets out so her father can’t marry her off; Mrs Watson coming from the stage; Charlotte’s sister starting to make her own living by writing down “Sherlock”‘s mysteries. Sherlock is a total fabrication created so that people will bring their issues to Charlotte. The books are a mixed bag, and I still have the third one on hold at the library, so I’m enjoying them enough to keep going on the series. Previous Previous post: Not quite weeknight pasta sauce. Still good. Next Next post: Yes, pasta + potatoes. It’s delicious.